The Fibonacci Tuners set of 8 tuning forks are part of a continuum of sound that spirals in and out of different realities. When we listen to the Fibonacci Tuners, we naturally seek out alternate realities within the sound. Each alternate reality is a location within a spiral revolving around a central vortex of stillness which connects with the Universal Energy Field. The Fibonacci Tuning Forks are set of 8 tuning forks. The Fibonacci sequence was well known in ancient India, where it was applied to the metrical sciences. The Fibonacci series may appear as an ordinary sequence of numbers but behind the simple group of numbers is an amazing fact that has become the foundation of mathematics which also served as the key to unlock some of the hidden mysteries in nature. Fibonacci Series can help man to understand the world in which he lives in. Fibonacci Series could also be one of the means to solve the daily problems he faces in his everyday living. As early as the period during the ancient Greeks, Fibonacci Series have been employed to discover the wonders of nature as shown in the various figures found on the natural world which includes the arrangement of plants, leaves, fruits, shells and almost anything anyone can ever think of. They have a frequency equal to that of the sound heard inside sea shells. They help us in finding realities inside other realities. Very often, healing is more forceful & better when done in an alternate reality than in a normal one. Usually people who have had some trauma or have some addiction, also go into different realities. These Tuners produce a connection between different realities which can help in healing in a big way. The Fibonacci Tuners Set has 8 Tuners. To distinguish them, they are numbered by ratios. The ratio is based on its special number series The first two Fibonacci numbers are 0 and 1, and each remaining number is the sum of the previous two. 0+1=1 , 1+1=2 , 1+2=3 , 2+3=5 , 3+5=8 , 5+8=13 , 8+13= 21 , 13+21= 34…. These Tuning Forks follow the number series with the first fork being 1/1, followed by 1/2, 2/3, 3/5,5/8, 8/13, 13/21, and 21/34. When we want to produce an interval, we always use the 1/1 Fibonacci tuner to create the interval we want. 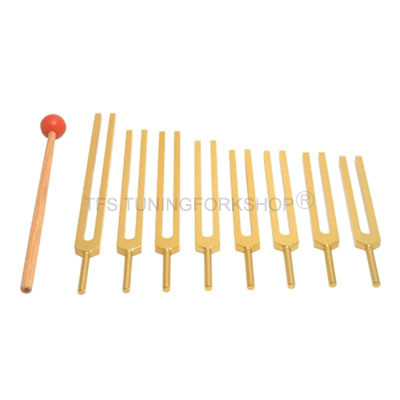 Like, to produce the interval 2/3 use the 2/3 tuning fork with the 1/1 tuning fork, or to produce the interval 5/8 use the 5/8 tuning fork with the 1/1 tuning fork. We can also mix any two or more tuners and explore the micro intervals they produce.